20 Pantry Labels. 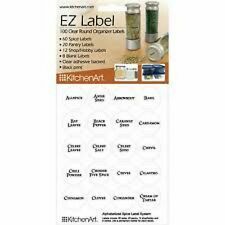 Fox Run Features: EZ Label 100 Spice Labels. 60 Spice Labels. Clear adhesive with black print so you wont see anything but the letters. These round labels are sized at 1 in X 1 in - 2.5 cm x 2.5 cm. Maximum loading capacity for each tier of this shelving rack is 66lbs. Item weight:10.23lbs. The shelf height can not be adjusted. 1Pc Display Rack. Color:as picture show. Size:Approxi.25 15 22cm. It is designed to be both sturdy as well as durable. The Edsal steel storage rack has a strong, coated-wire deck. This rack is simple to set up and will stand sturdily in place. Edsal steel storage rack shelves adjust on 3" centers. Muscle Rack 48"W x 24"D x 72"H 5-Shelf Steel Shelving, Black 5-shelf steel shelving with Z-beam construction for strength and rigidity. Shelves adjust every 1.5" and have a durable black finish. M ake it easy to sort and organize your garage, laundry, office, or warehouse with this Iron Horse shelving. This five-shelf shelving unit is made of riveted steel for strength and durability. Quick assembly with a rubber mallet. Multi-functional Use: Provides storage and organization for kitchen, attic, bathroom or office, etc. The Storage Shelf is made of high quality iron tubes and plastic connectors, sturdy and durable for use. Now, you can try to receive a box, and find it so easy. - Simple and generous; it can be hung on the wall to save space. Muscle Rack 60"W x 24"D x 78"H Five-Shelf Heavy-Duty Steel Shelving Unit, Black This Edsal Five-Shelf Heavy-Duty Steel Shelving Unit can be assembled horizontally or vertically. The unit's durable steel construction can support loads up to 4,000 lbs. 5-shelf steel shelving with Z-beam construction for strength and rigidity. Shelves adjust every 1.5" and have a durable black finish. Weight capacity: up to 4,000 lbs distributed evenly over the entire unit. Color: Sliver. Free installation, ready to use, fast and convenient, just suction up the wall. 1PC x Storage Rack. Material:Stainless Steel. Anyway we will try our best to avoid this kind of thing. 22" to 40" ceiling dropdown provides up to 105 cu. Ft. of storage. L x 48 in. W x 22-40 in. The Garage Storage Rack 4ft-by-8ft is the ideal system for you to have a highly organized and clean garage. 1pcs 30 pockets coin album page. Also can hold the ancient coins. Album pages size: about 252 200mm. The goods is just the album page, the coins are not included. Due to the difference between different monitors,there are color differences,pls take the real product as the standard!